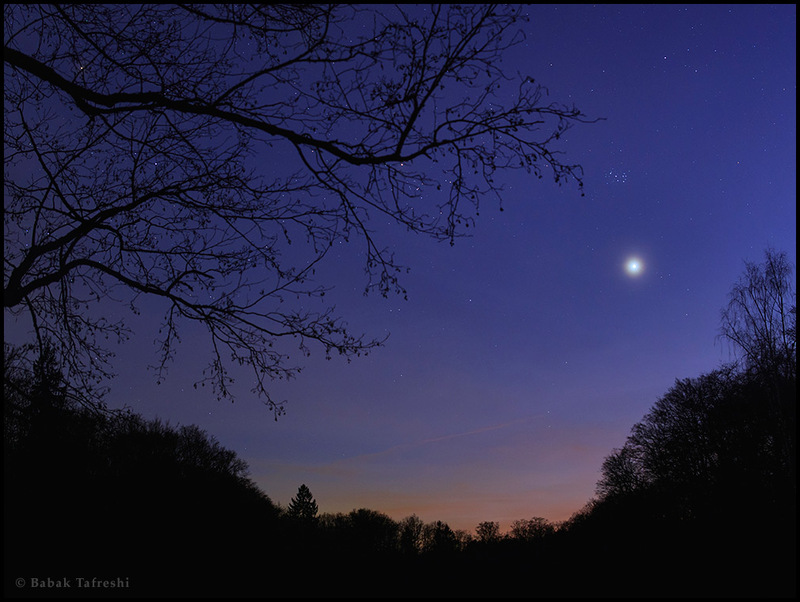 Explanation: In the coming days, Venus shines near the western horizon at sunset. To find Earth's sister planet in twilight skies just look for the brilliant evening star. Tonight very close to the Pleiades star cluster, Venus dominates this springtime night skyscape taken only a few days ago near the town of Lich in central Germany. Also known as the Seven Sisters, the stars of the compact Pleiades cluster appear above Venus in this picture. The budding tree branches to its left frame bright star Aldebaran, the eye of Taurus the Bull, and the V-shaped Hyades star cluster.